"Strangely enough, I first became interested in the Civil War period not while studying in the UK, but in Canada. One highlight for me of a fantastic exchange year at Queen’s University, Kingston, Ontario, was a history course on utopias and ideal societies. The course seminar was held on Wednesdays from 7pm to 10pm (although it rarely actually lasted the full three hours), a surprisingly convenient time (and better than the 8.30am lectures the university also held), because course reading could be done during the day, and we could go to the pub or university bar afterwards. One utopia that we studied on the course was The Law of Freedom, written by the Digger Gerard Winstanley in 1652. I later wrote my undergraduate dissertation comparing his ideas about the role of God and men in government with the ideas of Oliver Cromwell, and then wrote my masters’ dissertation comparing the Taliban government to Oliver Cromwell’s protectorate government, a proposal which unfortunately didn’t come together as well as it could have done. Many years later, when living in Oxford, disquieted with working in the charity sector and wondering what to do next, I kept saying to people that the thing that I would really like to do would be to create a website on Oxfordshire in the Civil War period, so during the summer of 2014, I started to read on the subject, the website was initially created in September 2014, and I put a lot of initial material on in early 2015. The site was initially entirely based around maps. I wanted it to not just be a blog with writing, but to be more interactive, and seeing as it is about a geographic area maps seemed a good way to convey that. 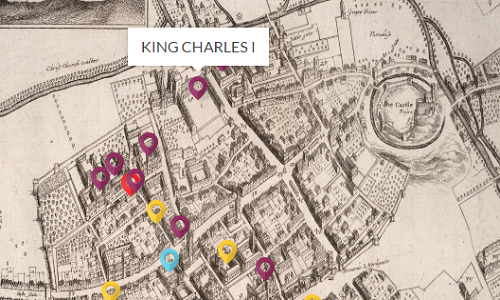 Civil War Oxford is a WordPress site, basically because this was the easiest way of doing it, and the maps are a plugin, which were found and set up by my boyfriend, who is better at software than I am. The map plugin didn’t really come with instructions, and it took me a while to work out how best to set up the menus on the left hand side, for example, how to ensure that they would not be automatically ‘open’ and showing the information inside them. They also can’t be reordered, which is annoying. I also imaged having maps with moving arrows on them showing the passages taken by armies, but does doesn’t seem to be possible with this particular plugin, and I shall have to work something out in the future. I used contemporary maps of Oxfordshire and Oxford, but have been trying to draw my own map of Christ Church, the Oxford University college in which the King was living. It became apparent that the maps didn’t really work when tracking a series of events, so I looked for easy to use timeline software, and found the Knightlab software, which is free to use and creates timelines based on information entered into a Google sheet. This software is very user-friendly, is easy to add images and tweets into, and looks impressive when fully set up on the site. I had also started a Twitter account linked to the site, but have never been very good at thinking of things to say on Twitter. Partly to give me something to say, I started tweeting the account from Anthony Wood’s memoirs of the first year of the war in Oxford. Anthony Wood was a noted 17th century Oxford antiquarian and historian who wrote accounts of his own life, the history of the city of Oxford and the history of the University of Oxford, which are very useful to historians today. He was also notable for arguing with everyone and supposedly frequenting the same pub (the Eagle and Child) that would be famously used by JRR Tolkien and CS Lewis for their weekly Inklings meetings 300 years later. Given that he was actually only twelve years old in 1642, he “borrows”, or rather uses without much attribution, an account from the University archivist, Brian Twyne. 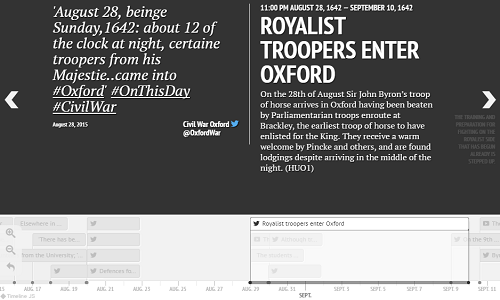 Brian Twyne left a near day-by-day description of what was happening in Oxford in the early months of the war, perfect for tweeting. Unfortunately, this detailed account doesn’t go beyond July 1643, so after a pause for a few months, I am tweeting the movements of Charles I and Prince Rupert from two primary sources, The Iter Carolinum of Charles I and The Journall of Prince Rupert’s Marches, which give a basic list of where they stayed on most days during the war until Rupert left England and Charles was captured. I am also considering using Samuel Luke’s journals, which have various spy reports from Oxford, but those only start in February. 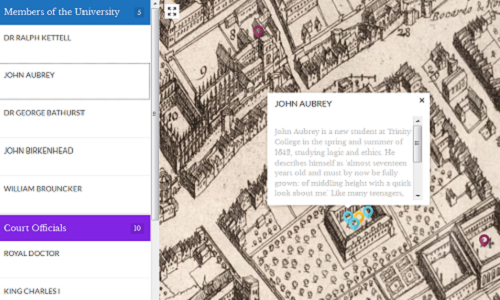 A teenage John Aubrey was a new student at Trinity College in the spring and summer of 1642, studying logic and ethics. Getting an overall knowledge of the period took quite a long time, and I still feel that I am only just starting out. I rather tend to work on the site in fits and spurts, depending on how the rest of my life is progressing. I have started using some of the primary sources, but not enough so far to get off narrative history and to write analytical articles, but I would like to do more of this in future. There are various primary sources available, but some are particularly noticeable by their absence. 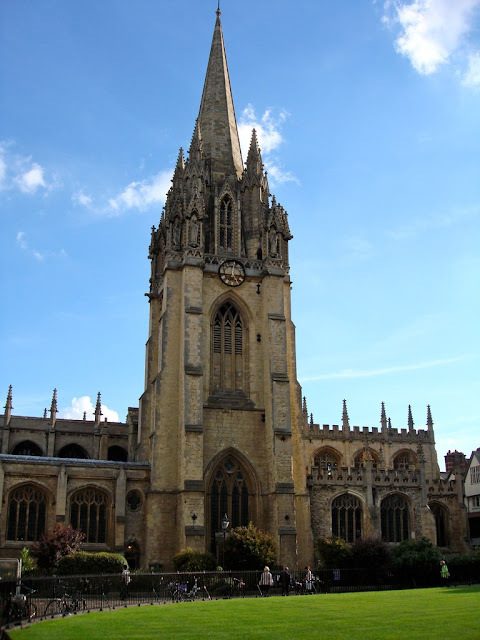 For example, records of the proceedings of the Oxford Parliament were destroyed when the city surrendered in 1646 and there are only two mentions of the King’s presence at Christ Church in the college archives, even though his stay there is well documented elsewhere. My immediate aims are adding more primary sources and writing more about events and everyday life in Oxford during this period. I also need to finish my Christ Church page at some point! More long term, I would like to write in more detail about life in the towns, villages and rural areas outside Oxford, to make the site more encyclopedic. This might mean moving on from using maps and timelines as the main way to convey information to more conventional web articles. I would also like to improve the software to make it more interactive. The subject is potentially very big and I don’t think I will run out of new things I could do for years!" Vanessa Moir read History at the University of St Andrews before completing a Masters in International Relations at King's College London. Both of her dissertations were partly based on the Civil War and Protectorate era. She lives in Oxford, where she previously worked as a tour guide for Footprints Tours, for which she researched and wrote new tours of the city and university. She is now seeking to work in historical publishing. 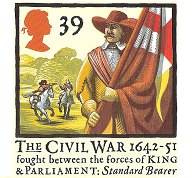 Many thanks to Vanessa for taking time out to explain more about the fantastic resource civilwaroxford.co.uk. You can also follow her on Twitter @oxfordwar.